Music has always been a part of my gaming life. My first group, who introduced me to RPGs, always listened to industrial, metal, and goth playlists during our gaming sessions. Rather appropriate for a bunch of nerds pretending to be vampires and werewolves. Those are some of my happiest memories. TL;DR Check out the links below to enjoy an instrumental, seaside-themed playlist. Playing background music is a really simple, easy way to evoke an atmosphere or mood. It was one of the first things I did when I took over that vampire and werewolf campaign from our previous GM*. As I’ve run more games, I’ve refined my process a bit, so I wanted to share what I’ve learnt. … but combine this with other terms that refine it. Because the soundtrack during a fight scene in a sci-fi movie is very different from that in a fantasy movie. For example, I ended up creating several playlists for a fantasy game, according to locations (seaside, towns/villages, forests) and scenes (calm, tension, combat, etc.). I found that it work particularly well when you need to set the scene quickly, like at the start of a new game. In particular, I wanted to start in a pirate-themed tavern because, well, pirates! Besides, who doesn’t love a good seaside vacation? I tried to choose music that evoked some aspect of the ocean or life on the sea. In other words, expect lots of wind instruments and accordions. Please note: the full playlist is on Google Play (I know, Evil Corporation), so you will probably need an account to listen to the full thing. But you should at least be able to get an idea of what I did. Alternatively, if you have a Spotify account, you can check out the abbreviated playlist at the following link. The reason this is an abbreviated version is that two of the albums I used are not available on Spotify. 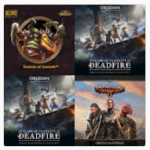 These are the soundtrack to Sunless Seas by Mickymar Productions, and the soundtrack to Pillars of Eternity II: Deadfire Archipelago by Justin Bell.